Toshiba's chairman is stepping down after the Japanese company reported a $6.3 billion writedown at its troubled U.S. nuclear business. The massive hit dragged the struggling conglomerate to an estimated net loss of $4.4 billion for the nine months ending December 31, raising concerns about whether it can survive its latest financial woes. 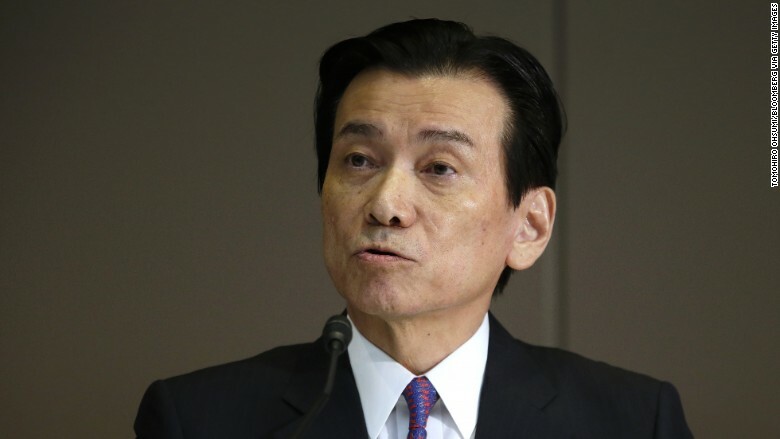 Chairman Shigenori Shiga is resigning to take responsibility for the widening crisis, Toshiba (TOSYY) said late Tuesday. The bombshell announcements capped a manic day during which the company's stock plunged as much as 10% after it missed its own deadline to report earnings. The iconic Japanese firm first warned in late December that it would lose several billion dollars from having to write down the value of the U.S nuclear construction business acquired in 2015. But the figure it announced Tuesday was even bigger than initially feared. Toshiba Chairman Shigenori Shiga is resigning to take responsibility for the firm's heavy losses. Toshiba shares closed down 8% for the day and have almost halved in value since news of the problems first emerged. The company now says it expects to have a negative net worth of $1.3 billion by the end of March, underlining its perilous financial state. It has said it's considering selling a stake in its memory chip business to raise funds. The numbers it announced Tuesday are only provisional, Toshiba said. It doesn't expect to be able to announce audited results for another month because it's investigating concerns about the accounting process at the U.S. nuclear division. The company's U.S. subsidiary Westinghouse acquired nuclear construction business CB&I Stone and Webster in late 2015. The acquisition was supposed to help Westinghouse complete nuclear reactor projects in Georgia and South Carolina. But the U.S. projects are running way over budget and behind schedule. Toshiba later admitted it may have overestimated the value of CB&I Stone and Webster. Toshiba is one of Japan's best known multinational corporations, tracing its history back to the late 19th century. The company made Japan's first light bulb and manufactured the country's first electric washing machines and refrigerators. It now makes everything from TVs to memory chips, and had turned to nuclear plant construction to try to help it recover in the wake of a massive $1.2 billion accounting scandal. There were signs of a turnaround last year, Toshiba reported earnings of 115 billion yen ($977 million) through the first six months of its 2016 financial year. But now the company is back on shaky ground, and Toshiba admits the huge investment in the nuclear business may have been another misstep. "We may revise the positioning of nuclear business in the future if it's needed," CEO Satoshi Tsunakawa said in December. -- Jethro Mullen, Yoko Wakatsuki and Junko Ogura contributed to this report.